Surfrider is very excited about the new Ocean Friendly Garden project just installed on the Village Green in East Hampton. The project is the result of a new partnership between East Hampton Village, the Ladies Village Improvement Society (LVIS) and the Eastern Long Island Chapter of the Surfrider Foundation. Three bioswales have been designed and installed in the Village Green to help absorb and filter out pollution from road runoff that enters the green at the base of Main Street by the flag pole. These bioswales have been planted with native plants tolerant of the flooded, wet conditions that often occur at the green, and they are connected by a ‘stream’ of plants that follow the natural contour of the green and the subsequent flow of water. Thanks to Stephen Mahoney of Mahoney Farm & Nursery for the original vision for this project, bringing together all the partners, and shepherding the project through to completion. Big thanks also to Tony Piazza of Piazza Horticultural for the beautiful garden design and installation. Like many other coastal ponds on the East End, water quality at Hook Pond has been affected by high levels of nitrogen from septic systems, wildlife and stormwater runoff. These conditions have led to the unfortunate occurrence of toxic algae blooms that wreak havoc on the ecosystem and pose a serious public health risk to pets and humans from recreational exposure. The Ocean Friendly Gardens on the Village Green will help receive and treat road runoff, allowing it to soak into the ground and filtering out pollutants, before the water enters the groundwater and Town Pond, and then on to Hook Pond and ultimately the ocean at Main Beach. 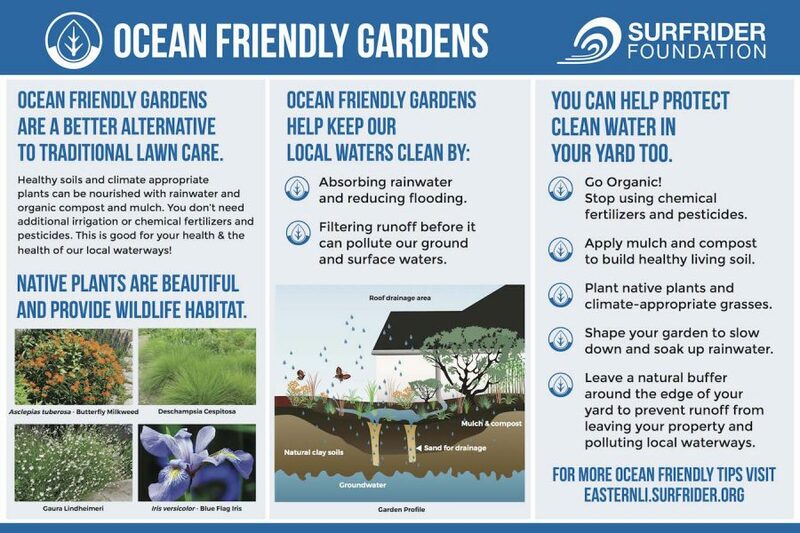 Surfrider’s Ocean Friendly Gardens program takes a watershed approach to solving water pollution problems. 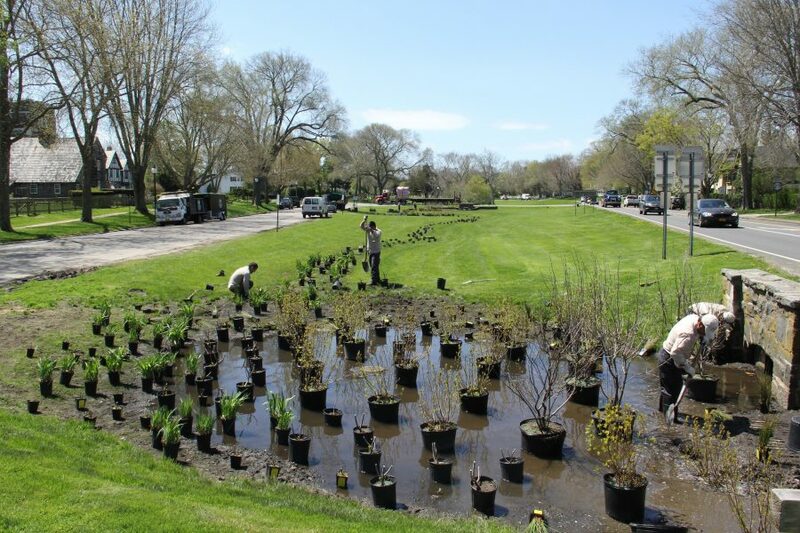 With the current project located at the southern receiving end of Hook Pond’s 2,600 acre watershed, we hope these gardens can help contribute to improving water quality conditions in the Pond and a decrease in the prevalence of algae blooms. 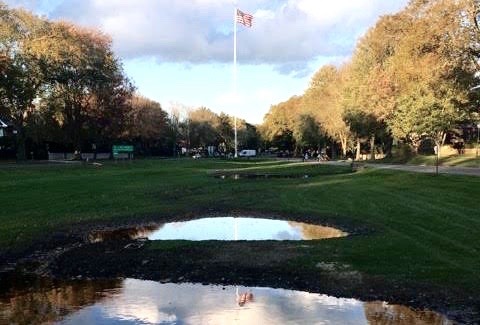 Learn more about current water quality issues in Hook Pond in the Water Quality Improvement Study posted on the East Hampton Village’s website. Since its installation, the Village Green has been a beautiful, inspiring and educational asset for East Hampton Town. It has been routinely covered in various local media outlets, especially once it bloomed in mid-August. Located in the center of town, the Village Green has been an incredible tool for our Education Programs, for which we will continue to use and point to East Hampton’s newest Ocean Friendly Garden. East Hampton Middle School Surfrider Club enjoying a Water quality workshop at the Village Green. 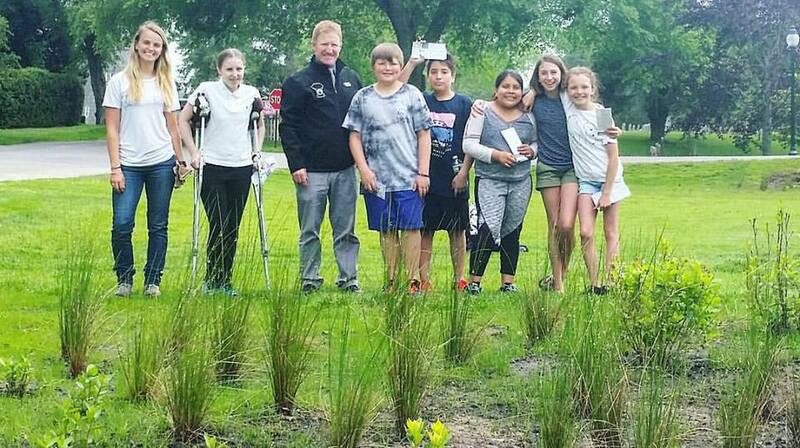 Special thanks goes out to the Kate W. Cassidy Foundation and the Walrath Family for their financial support of the EH Village Green Ocean Friendly Garden project. To learn more about how we can all take steps to make our own yards more ‘Ocean Friendly’ please click here.